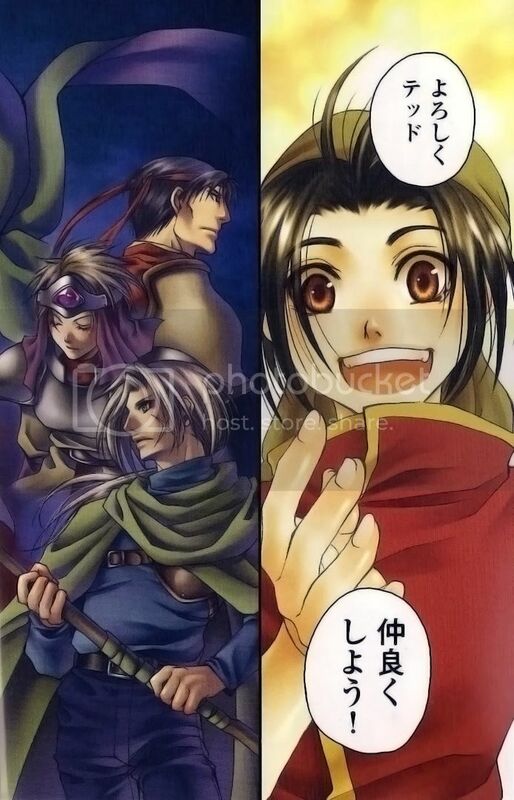 After the Suikoden III and Suikoden V (still in progress) manga adaptation, Suikoden I and II hagve now their own first manga volumes, which came out on sale at same time. This time, thats drawed by Yu Hijikata, who is experienced in this stuff, since she already did the same with Valkyrie Profile. Personally I rather Aki Shimizu's work, but even with that I cant wait to read it. I wish they sell that outside Japan, at least in english. The number of volumes is still unknown, when Ill have more info Ill updat it. May be i could obtain scans when they release it, if that was the case...since this things usually never watch de light on occidental grounds...would be insteristing make a fan-translation. So...in the case i get the scans...there are here someone who could make a good japanese--> english translation? I make it clear, is not sure yet if i can get the scans, but if i get them...we can do it. All the "edition" part will be on my hands. But...i still need the most important...translator. Neclord X wrote: So...in the case i get the scans...there are here someone who could make a good japanese--> english translation? My best would be to contact ramsus-kun, since it already made few(all?) 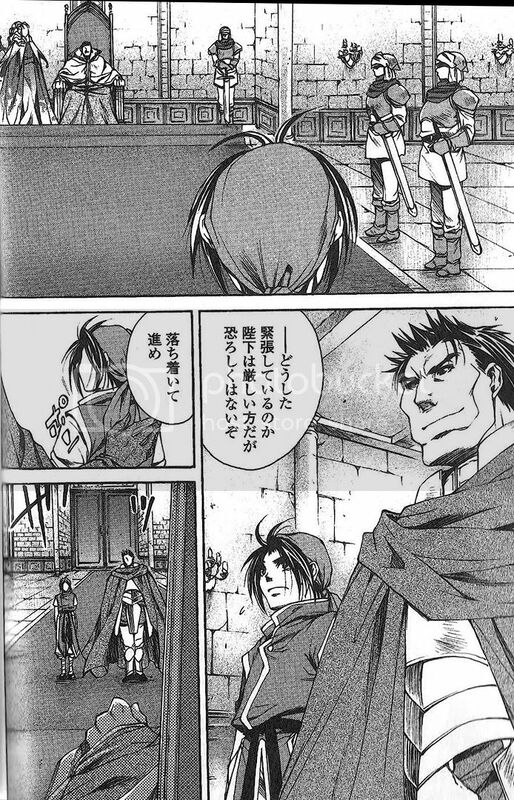 doujinshi translation about suikoden. or ask at http://something-or-other.webs.com/home2.htm . They made Scanlations of the BoF IV, FF XII, SO 3 mangas, so they're into RPGs which are adapted as mangas I think. A funny little story for all of you. So I'm here in Japan for a one year scholarship to learn Japanese. I was quite bored 2 days ago, so I went on a small excursion. After getting extremely exhausted from walking to the city library, I decided to go into this small mall and hang around for a bit before going home. 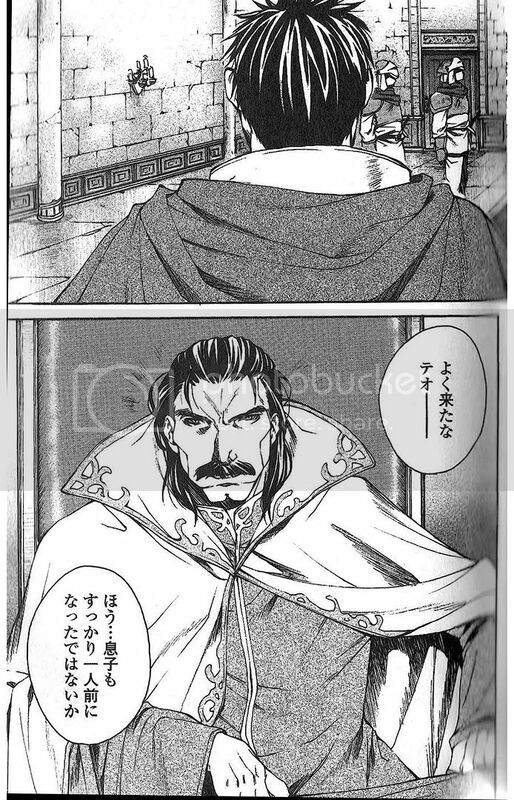 I was skimming through some manga, when for a second, I thought I saw Tir's face on the bind of one book...oh, yes, it was Tir alright....my eyes quickly went back to it, and there I saw the new suikoden 1 manga lying right in front of me. Next to it was suikoden 2. =) i had to buy it ASAP. I had no money at that time, so i went back yesterday and bought it. =) My japanese is still a bit rusty so i need to practice my kanji so i would be able to fully understand the stories. So far, ive skimmed through it, and the manga seems to be pretty good. Nice art work. Clean character designs...i was slightly shocked to see that Tir and Riou talk in the manga. =) if you guys would like, i could post some info about the manga. so far, from the back of my head, i can tell you they renamed riou into Tao, and they altered some scenes a bit for story purposes (ex. when riou and jowy go back to kyaro, they dont go through the whole mist monster scene, and they dont even meet the gypsies)....ill try to post pics of the manga later. has anyone else bought this yet? impressions? ‎"...Or else, it is the dream that haunts you. You wait with the promise of the next dream...when the act of waiting is dependent on remembering." Translators are being sought for in the topic too, so you may consider joining them if you have the time? BTW, curiosity: they changed the names from the novels: Tir will be called Ryoi and Riou will be called Tao. That's just like them to officially endorse another set of names for our precious Heroes. Guess the Prince should get the credits for starting this lovely multiple officially endorsed names trend. ^ gosh. silly old me didnt see that. sorry patapi. 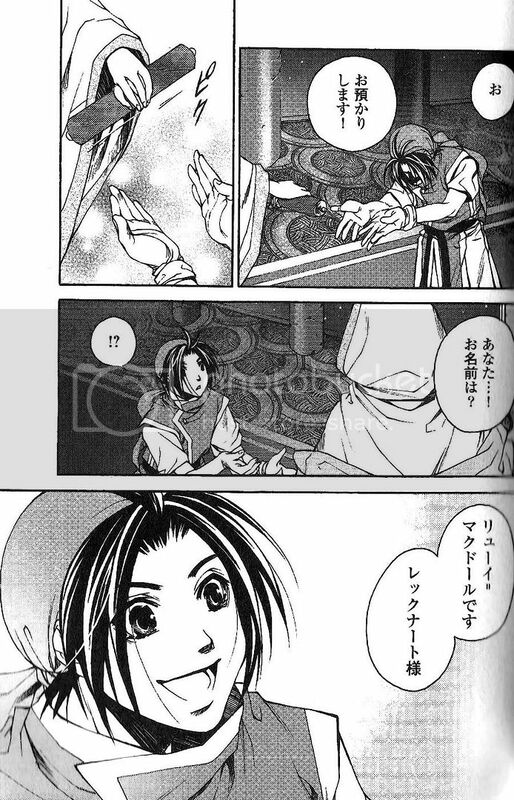 i really like how the end of suikoden 2 volume 1 ends with a flashback of how jowy and riou started their friendship. im enjoying the manga so far, and i find the pacing pretty well planned. its understandable they had to alter and remove some scenes you get from the game. at least the main context is still there. somehow, i miss pohl though. such a minor character, but hes quite the young hero as well...asking flik and viktor to save riou and jowy, protecting pilika, etc...which reminds me, i should check again later to see if jowys "do you want me carrots" line is still there. I merged the two topics, since there's hardly anyone discussing the subject anyhow. How's the quality of the Suikoden I's manga then? I have someone in the duty of scan the mangas, it would be best if you could concentrate yout efforts to translate them with your friends help. BTW, the manga cuality is quite high, lot more than expected. Each volume have 164 pages and they cover to "battle with queen ant" in S1 manga and to "Toto destruction" for S2. I get the scans for the SI...im cleanning it right now. The quality is quite high, here an example. However, bishonen content is like 300% more than expected. News, since i don't have news about Ns...i must continue in seaching translators. 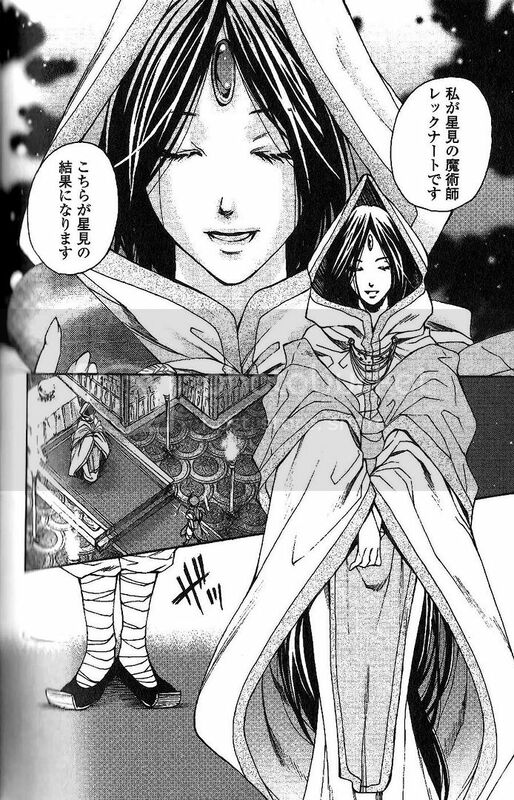 I contacted with Ramsus and he looks interested in translate the Suikoden I mangas, so if all goes well, he will translate the Suikoden I manga. However, since he has some other projects i don't know how much time this could take. But in beginning, we have translator at least for SI manga. 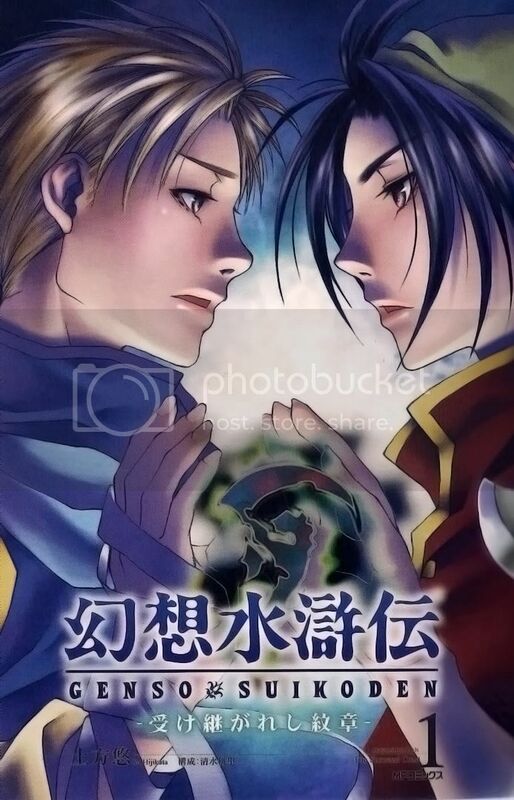 Suikoden I and II mangas vol 1, at the moment only in japanese of course, but i know some people would like to check them even in jap also...you didn't need to much japanese to know what they are saying Right? That second picture, the color one of the McDohl servants, makes Gremio look waaaaaay cooler than he did in the game. It might have been his wimpy dialog, but he looks a lot tougher in that picture than I had ever thought before.